A couple of months ago, Damien Franco of YourPhotoTips.com wrote about why he uses Aperture Priority Mode for most of his photography. It is an excellent article which shows how a photographer thinks through the exposure triangle of Shutter Speed-Aperture-ISO. Damien goes on to rebuke a couple of popular myths which often hold back photographers using digital cameras. I do not agree with his choice of exposure modes, however. What if I was to tell you about a mode which automatically selects a good exposure (aperture (f-stop) and shutter speed) to start with and allows you to change them for more or less depth of field OR slow or faster shutter speeds just by moving a control dial. Interested? I thought you might. That is the mode I use called Professional Exposure Mode as described by photographer Ken Rockwell (search for it on the linked page). Referred to as Program or simply P-mode in most digital camera manuals. Hold on you say, isn’t that AUTO mode? No, this Professional mode differs from AUTO mode in that it does not change the camera’s ISO number, Metering and White Balance settings giving you more control of your photography. This is how I use Professional or Program mode. I set up my camera dial to P, ISO starting at 200, White Balance at Auto and Matrix metering. This gives me great flexibility for most shooting conditions I might encounter. (Note: I also use my Nikon D700’s Auto ISO feature which starts at ISO 200 but when light falls off in a building or as day turns into night, the camera will raise the ISO for me. You may have to remember to change your ISO setting when shutter speeds go below 1/30th of a second.) Now, when I see something I want to photograph, I set my focus and see what exposure the camera calculates. If I don’t agree, I can turn the command dial to vary the aperture and shutter speeds. It still gives me the same exposure but by turning the dial I can increase or decrease the f-stop controlling the depth of field. Like in Aperture Priority mode, the shutter speed will be changed for you. The reverse is true for moving the command dial to alter the shutter speed. The f-stop will be changed for you. When moving the exposure away from the camera’s chosen one, an asterisk is seen next to the P on the upper LCD (for Nikon) to tell you you have selected a different exposure. It looks like this: P*. After pressing the shutter, the camera does not return to the starting exposure unless you move the command dial back to that position. This may be different for your camera so, again, check your manual to see how Professional/Program mode is implemented. Do I use the other modes? You bet-cha! Shutter Priority is what I use for sports and motion work. Aperture Priority is reserved for long exposure work with a tripod. Manual is for very tricky lighting situations like fireworks. In most of my photography, Professional Mode is perfect and gets me to the exposure I want to use faster and easier. As Damien points out in his article, I got my digital camera to help me make better photos. With the camera assisting and my experience and knowledge controlling it, I believe I do make better photos then I did with my old 35mm manual film camera of 30 years ago. What exposure mode do you like to use? In the photo below of Sunset Blvd. in Disney’s Hollywood Studios, Professional mode initially gave me an exposure of 1/500s at f/5.6. I wanted more depth of field and moved the command dial until it showed 1/250s at f/8 which, for a focal length of 50mm or less, gave me the depth of field I was looking for. The slower shutter speed lightens up some of those deep Florida sun shadows, too. Walking down Sunset Blvd. in Disney's Hollywood Studios. Nikon D70/18-200VR, 1/250s, f/8, 200 ISO, 0 EV, 46mm Focal Length, Matrix Metering, Auto -3 White Balance. This entry was posted in Photography and tagged 18-200mm vr, aperture priority, nikon D70, professional mode, program mode, shutter. Bookmark the permalink. So, P mode is like having A and S mode put together in one handy button, yes? That is correct, KD. For Nikon’s it is the rear command dial. Give it a whirl. It is perfect for places like Walt Disney World. Ah, yes, my youngest daughter was abut the same age as yours when suddenly the thrill rides were fun and not so scary. Have fun! The Tower of Terror has been enhanced again this year. People are saying the new special effects are just awesome! So P mode is pretty much Auto with certain settings that you choose, that stay the same unless you change them? Then why not use these same pre-sets and choose Manual? If you change SS and/or f-stop in P, then those are changed just as fast in M, right? Or am I missing something here? Personally I prefer Manual. The only auto settings are WB and focus, and sometimes I switch to manual focus. Only in sports photography do I switch to shutter priority. P-Mode is different as it will change EACH of the exposure triangle (for Nikons), shutter speed, f-stop and ISO, as you move the dial. In Manual mode, you change each one which takes more time. It is not for everybody but I have found it very intuitive in my work. Very interesting, Scott. I was trying to translate this to the settings on my camera, and could see what you were saying. I think I was using that setting when taking my falling acorn shot. I put it on “P” or whatever it was and set the ISO at all different settings. The only setting that would capture the acorns mid-air was 3200 ISO. I wasn’t thrilled with the quality of the photo, but was thrilled, thrilled, thrilled to be able to get one photo (out of 20) that actually captured falling acorns. That was the hardest thing I’ve done in months!! It did come out great, Kathy. High ISO on the small sensor of a Point & Shoot class of camera is usually not very good. However, some are getting better like the Canon PowerShot S90 camera I placed on your guest post. Great post Scott. I’m a manual shooter myself. Be it hardware or software, we all develop our own workflows, our way of doing things. This can be a double edge sword; on one hand we get fluent with that one process which enables us to handle it almost subconsciously, on the other hand it closes our eyes on other alternatives. Even as rooted I am in my routine, I can see where incorporating this mode would be an advantage under certain circumstances, and until now I’ve given it little thought. Thanks. Have to agree with Michael. As photographers (artists + technicians) we can all too easily get caught up in our all too specific work-flows. Exploring, even if just to experience or practice, other ways of doing things really can open your eyes to new techniques. I’ll have to give “P” mode another chance. I have to admit I haven’t used it in a while. Perhaps it’s a good thing to learn for when I just need to grab my camera quickly because the kids are doing something beautiful but fleeting. It is very handy for such scenes with lots going on. When I go to Walt Disney World, I rarely take it out of P-Mode as I never know what I’ll see as I tour the parks. Welcome, Michael! Good luck with your new website and blog. Stop by anytime. You are so correct. It is easy to get caught up in using the tried and true. Which is why I will do creative exercises like go out with only one lens and photograph all day with it. Even more fun with prime lens. Or shoot all in manual (even focus!). You have not had your SLR camera long, Karen. This is a tough time of year to really get to know your camera. My suggestion would be, when you can, to read the manual (as boring as it is). Have your camera nearby so you can refer to it. Find all the buttons, menu options and switches. The object is to be able to change the most important settings without having to move your eye from the viewfinder. The better you know your camera the better you’ll be able to jump from the science part of photography (all the numbers, settings and such) and move on to the art part of photography. You’ll find the journey a bit frustrating at times but the rewards when it starts to ‘click’ (pun intended) is enormous. I believe (but not positive) the command dial on Canons do the same as the rear command dial for Nikons in P-Mode. Please, let me know either way. You are correct! I just checked out my P mode and the command dial does the same, but it does go back to its original choice for exposure after you take the picture. I don’t get a P* though. I promise I’ve read my manual! 😉 I keep it near by while I’m working my way through the Peterson book too. I’ll keep re-reading til its mostly installed in my brain. It’s funny….when I first started out, I shot almost exclusively in Programmed Auto Mode (P or P* when I changed settings). Then I got all fancy and pretty much shoot only in Aperture Priority or Manual Mode as most times, I am only concerned with DOF and can then alter the other settings as necessary. As usual, you’ve given me something to think about and I can see that P-mode would be quite useful in situations where the light is changing fast or there is alot going on. Makes me go hmmmmmmm…. TOT…went on it once…never again. If I make a few people go “Hmmmmmm….” that is a good thing. As mentioned above, it’s easy to get comfortable with one technique and miss out on something that could be useful. I hope you re-visit P-mode for some of your future shooting. LOL Sorry you didn’t like ToT. It’s my favorite ride at Walt Disney World. The theming in my opinion is the best Disney has ever done. Scott, I’ve been shooting in AV mode and a bit frustrating since I don’t have a full understanding of the different settings yet. I tried the P mode today at the rice paddy and really liked it, I have a better understanding now than I did before. I wasn’t sure about your Matrix metering in comparison to Canon and chose the center-weighted average, but after doing some reading tonight, I realized that it’s the same as my Evaluative metering. Your setting for the “White Balance at Auto -3”, won’t that make the image real dark? I guess not in the bright sunlight because your image looks great. Thanks for this post, it has been very helpful. Yes, there are few wording differences between Canon and Nikon and I will try to include both in the future. Nye. I have never used a Canon so I tend to be Nikon-centric. I do know most Canons do not have the Auto ISO feature which can cause problems using any mode as you have to change the ISO manually. I believe (anyone know for sure? ), the latest Canon dSLRs now have Auto ISO (7D, 5D MkII). For my older (6 years now) Nikon D70, setting white balance to Auto -3 really saturates colors. I love color and this setting gives it to me. It can also get me trouble if there is a lot of red in the frame. If there is I have adjust that in post by toning it down some. Scott, don’t worry about translating into Canon language, I’m just thankful that you give us the info that we need and doing a little research is part of learning for me. My canon T2i has an auto ISO, which works well when I’m not sure of the setting. I’m not sure about the white balance setting in Canon, I have to read up and experiment on that. For landscape photography, I live in Aperture priority mode, too. I like how you have found a use for the P-mode, too. Comes in handy for events for sure. Yep, that is the bottomline. 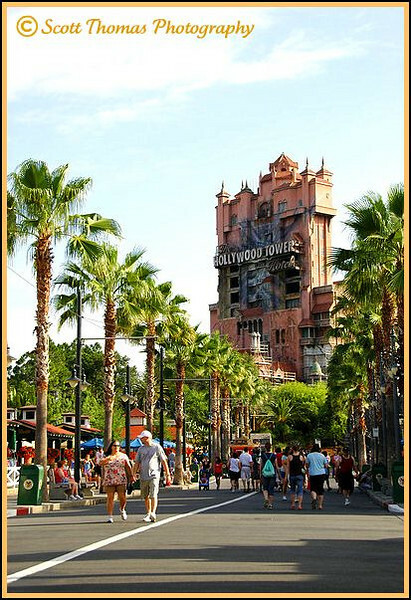 Sounds like you are using the P mode as a meter…..I love that ride in Disney, scared me and the kids half to death. I guess I am but it helps me to be creative faster. A good scare now and then is healthy, especially under wonderfully fun conditions as the Tower of Terror. BTW, they just enhanced this summer and people are raving about it. Thanks for the tips Scott. I never shoot in Professional mode but will try that. I think you will find some uses for it, Consuelo. However, for most of what you post, I think you’ll end up in Aperture priority mode most of the time. Especially for HDR work, P-Mode is not the one to use as it will change both shutter speed and aperture as the EV changes to compensate. By the time I opened the box on my new Canon T2i (my first DSLR) I’d already spent months reading up on aperture, shutter, iso, exposure comp. and so on, so I swore to myself that I would not shoot a single frame in any of the auto modes. So far I’ve kept my word. My go to mode is aperture priority (Av), although I’ll jump to shutter priority (Tv) in a pinch if I want to freeze something or get a blur. I also recently spent a day shooting in manual (M) and was surprised at how easy it is. It’s actually quite useful for making you pay attention to your shutter speed, I find. I haven’t shot in program mode yet, but I’ll definitely give it a try on my next outing. When using a speedlight the program mode automatically forces a minimum shutter speed of 1/60s, which is handy. The one thing I wish the T2i had was the ability to change the iso by 1/3rd stops instead of full stops. The Canon 7D allows that. Are you sure you can’t change the ISO increments on the T2i? I can on the Nikon D70. Either to 1/3 or 1/2 stops. Might want to consult the manual there. I am not a fan of speedlight shutter speeds in P-mode defaulting to 1/60th. Many times I like to drag the shutter using slower shutter speeds so the camera’s sensor soaks up the background ambient light before the flash goes off. When I want that to happen, I usually use Manual mode. I think in your street photography, you may find P-Mode to be very helpful. Oh yeah, I checked and double checked. What I can do is set an ISO upper limit for auto ISO mode, which I thought was really handy when I first got the camera (used to leave in Auto ISO with the limited set to 400 when outdoors), but now I pretty much always select the setting I want. The Canon 7D does not have this feature, but does allow 1/2 and 1/3 stop ISO selection. I’ll definitely have to read up on P mode some more. Thanks. Scott, I have found the same concepts work on my new point & shoot. It is a Canon and when I put it in P mode I have so many options for changing it up that I don’t have in the Auto mode, which I never use now. I think with some of my food photography I am going to start using the Aperture Priority mode a little more now, although I have to keep reminding myself that those aperture numbers on a point & shoot do not line up with those of a real DSLR. Yes…Point and Shoot cameras work the same way as a dSLR. But, as you say, the numbers are not the same. It is hard but not impossible, as you found out, to create bokeh (the fuzzy out of focus background) with a point and shoot. They are not designed that way. Aperture priority mode is used a lot in food photography. Selective focus helps to make the food jump out at the viewer. Almost 3-Dish. Looking forward to seeing what you do now that you’ve learned more about your camera. I’d be very interested (as is my stomach! LOL). Yeah, I used to use P-mode a lot for much the same reasons. One of the differences between Nikon and Canon here is that Nikon’s Auto-ISO wrongly operates based on you setting a minimum shutter-speed (e.g. fixed 1/30th), while Canon’s correctly works from 1/focal_length. For this reason, I’m quite happy to use Auto-ISO when shooting Canon (or Panasonic, these days). 1) My subject-matter dictates that I’m more interested in setting the aperture – either to control it, or where it doesn’t matter, to try to keep close to the lens’s optimum sharpness (mostly f/8 on my kit – yes, I’ve profiled this). 2) I shoot a lot with manual M42 / Minolta prime lenses where the adapter breaks electrical contact, so the camera won’t fire in P-mode anyway – but does in aperture-priority instead. No change of mode required. I even shot a sports event mostly in A-mode, recently – bright sunshine meant that fast shutter-speeds were attainable at lowest ISO regardless, so I could concentrate on operating at optimum lens performance aperture instead. Looks like your subject and equipment dictates what you need to shoot with and at, Tim. Though I still use P-mode the majority of the time, I can easily switch out of it when needed depending on how I want to convey the scene or action I want to photograph. It is great when you can photography sports in good light and be able to stop the lens some to get more depth of field and then quickly open up as a way to separate the action from the background. I was able to do that this summer for a baseball tournament and it was freeing. Normally I shoot indoor sports and have to weasel out every bit of light I can.